For Rurouni Kenshin, Nobuhiro Watsuki took a hint of historical accuracy, blended it with some great fictional characters, and produced one of the most gripping, engaging, and most enjoyable series ever written. Many of our readers have already watched the entire TV series (either by purchasing the 20+ DVDs or checking it out on the Cartoon Network), the Trust, Betrayal, and Reflection OVAs, and the Motion Picture. Ironically enough, the only place many of us haven't gone yet is back to the original source - the manga that started it all. It's been more than ten years since Watsuki originally wrote the stories featuring Hitokiri Battosai (in English, Battosai the Manslayer), but they're just as entertaining as they were back in 1992. 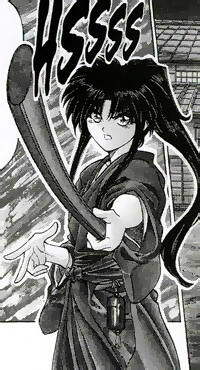 Watsuki's Shonen Jump appearance, which is also the first Kenshin story, didn't initially receive much attention. After rewriting the details, however, it took off when it was re-released in 1994 in the same comics anthology. The original story is actually included at the end of the first English volume from Viz, which is a nice added bonus. With the added perspective of the TV series, it's quite interesting to see what differs from the animated version - and how much remains the same. Not too long ago, Japan was going through some bloody and turbulent times. The group of islands that compose the modern nation was once a collection of mostly independent feudal kingdoms ruled by local lords. The unification process was a long, bloody, and arduous endeavor. Our hero, Himura Kenshin, a fictional revolutionary who helped bring about the Meiji Era, wasn't always a Rurouni, or wanderer. During the Bakumatsu period of Japan's history, he served as a young but fearsome assassin for the forces trying to usurp the ruling class. Over the years while he served in this duty, he slew countless targets with ruthless precision. If you'd like to know more about Kenshin's past, check out the two OVAs, released domestically by ADV films. For some oddball reason, instead of calling the two releases Rurouni Kenshin, they were renamed Samurai X. ADV kept the original subtitles of Trust and Betrayal on the discs, at least. While it's true that Himura has a cross-shaped scar on his face, I always felt that Samurai X was a rather lame title for two of the best OVAs available today. I suppose that's why I'm not a marketing director. The television series, which is based directly upon the comics, is available completely from Media Blasters. Finally, the last video release is essentially a recap of everything. Once again from ADV, it's called Samurai X: Reflection. With the messy historical details out of the way, we can now move onto the manga. This part of Kenshin's tale starts after the feudal government has toppled, largely due to the swordsman's efforts. However, Hitokiri Battosai effectively died at the end of the revolution: that is, after years of murdering people in the name of his cause, Kenshin gave up killing. When the new order was finally established over a unified Japan, Hitokiri Battosai faded away, declining to take his share of the spoils so many of his compatriots were claiming after toppling their predecessors in power. Thus was born Himura Kenshin, rurouni. The former killer made a decision never to kill again. He reversed the blade on his katana with the dull side facing out, and set out upon the land as a wandering swordsman. 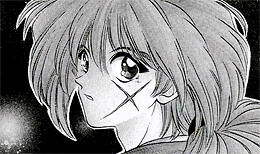 Yet, the name of Hitokiri Battosai could never be wiped from the memories of the people of the age, and Kenshin's past was fated to forever haunt him. Determined to start anew, Kenshin spent the time after the revolution helping others in need and traveling from place to place. This story begins when he meets a young woman named Kaoru Kamiya seeking out the legendary manslayer. Rumor has it that her father's sword style - one developed to protect lives, not take them - has been corrupted by a man claiming to be Hitokiri Battosai, and she confronts Kenshin when she notices his sword. What she doesn't realize, of course, is that the man who is killing in the name of Hitokiri and her father's style of kenjutsu is merely an imposter. Amusingly enough, she quickly dismisses the small-framed Kenshin as someone who could not possibly be the dreaded assassin of the revolutionary age. As the story progresses, Himura will frequently be forced to stop others who harm people because of his past. At the start of the Meiji era, swords were outlawed and Western ships were just beginning to bring over newer, deadlier weapons, such as firearms. It was a time marking the end of the samurai, and the death of the way of the sword. 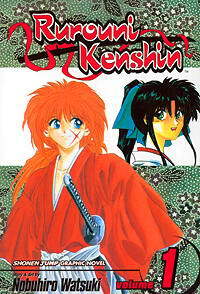 In many ways, Kenshin is a relic of times past, but he lives to atone for his way of life when he was a manslayer. After Kenshin aids Kaoru, he makes a rather momentous choice. Rather than continue on his way as a wanderer, he decides to stay with the spirited young woman and help her rebuild his dojo. Thus, for a brief time in his new life, the wandering samurai remains in one place. Rurouni Kenshin is the only manga series I own completely in Japanese. I'm no expert in the language, but I've been a big fan ever since I saw a fan-subbed copy of Trust, so I was bound to pick them up whether they were in English or not. Now that the books are being released domestically, however, it has provided me with an interesting opportunity to compare the imported editions I have with Viz's local releases. Just for fun, I thought I'd pass on my findings to you guys. The first thing I noticed is the size difference. Even though Rurouni Kenshin is printed in Viz's new, smaller format, it's still almost a half-inch taller and wider than the Japanese Jump Comics edition. The cover features the same artwork, but it's arranged differently. The original Japanese cover is printed horizontally, offering a wider view of the art than the vertically oriented English edition. The cost, of course, differs as well, though Viz is one of the industry leaders in aggressive pricing structures. In Japan, the first volume went for 388 Yen (roughly $3.50) whereas the US edition is $7.95. Yet, $7.95 is significantly better than the $15.95 price tag most Viz titles ran for only a year ago. Both books read from right to left, as originally written. I imagine this is a title that would be especially troublesome to flip, given the fact that Kenshin's scar would be on the wrong side of his face. While not everyone pays such attention to detail, if Nobuhiro Watsuki hadn't cared which side the scar was on, he'd have switched it around every once in a while to see if we were paying attention. As far as I can tell, nothing's been edited or removed from the English edition, but unfortunately, the original sound effect artwork has been covered with bulky English words. I've always appreciated the look of Japanese writing even if I can't always translate it myself, but I never realized how much is concealed when new effects are pasted over the old ones. I can live without seeing "THOSH" or "PIF" scrawled across the original artwork. I realize this is so that the mainstream audience won't freak out over Japanese text, but I'm not too sure keeping the original sound effects intact would deter anyone from buying this excellent manga. I do know that many diehard fans would choose the imports and a fan translation over a book with altered sound effects, however. That about wraps up my comparison of the two editions. No matter how you slice it, this is a wonderful story anyone can enjoy. I'm simply glad it's finally available in the US so that an entirely new continent can be introduced to Rurouni Kenshin. Even if there are edited sound effects.